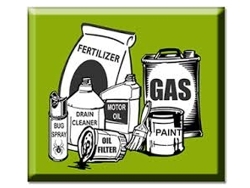 The following section will describe Household Hazardous Waste, how to reduce and then take care of the products you have. 1. Ignitable - Combustible or flammable such as paint wastes, some degreasers and other solvents. 2. Corrosive - Burns the skin, corrodes metals or other materials such as battery acid, rust removers and acid or alkaline cleaning fluids. 3. Reactive - Is unstable or undergoes rapid or violent chemical reaction with water or other materials such as cyanide plating wastes, waste bleaches and other waste oxidizers. 4. Toxic - An extract from the waste is tested and found to contain high concentrations of heavy metals such as mercury, cadmium and lead, or specific pesticides that could be released into the ground water. 1. Before you purchase a product, read the label and make sure it will do what you want and don't buy more than you need. Once you buy something, you are also responsible for disposing of it properly. 2. Read and follow directions about how to properly use the product and dispose of the container. Pay close attention to warnings such as "do not incinerate" or "do not mix with bleach. 3. Organize a neighborhood swap to get something you need or get rid of excess products. 4. Be sure all containers are properly labeled and not leaking. 5. Follow directions on the product label when discarding containers. 6. Store products in a secure area, with lids secured, away from children and pets. 7. Never mix products. EVER. 8. Products should have an information phone number on the label for any questions you might have. If not, call the Bartholomew County Solid Waste District at 376-2614.